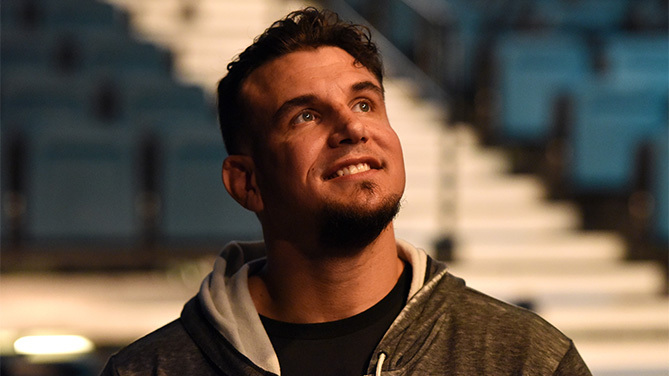 Frank Mir wasn’t sure what to think when he was called in for a meeting with UFC president Dana White last week in Las Vegas. It was all good, as White broke the news to the former two-time UFC heavyweight champion that he was going to be inducted into the Southern Nevada Sports Hall of Fame on July 24 at the Orleans Arena. “Knowing some of the people, like (Mike) Tyson and (Andre) Agassi and Dana himself, that have already been a part of it, it’s great to be in there,” Mir said. Born and raised in Las Vegas, Mir becomes the first UFC (and MMA) fighter to receive a place in the SNSHF, joining his UFC colleagues White, the Fertitta family and Marc Ratner, along with the likes of Tyson, Agassi, Greg Maddux, Jerry Tarkanian and other local notables that have made their mark both at home and around the country and world. Mir, 36, certainly fits the bill on all counts, having competed in Canada, Brazil, throughout the United States, and of course in his hometown of Las Vegas. Winner of the UFC heavyweight title in just his ninth pro fight when he defeated Tim Sylvia in 2004, Mir’s story truly took shape after a motorcycle accident three months after the bout nearly ended his career. Forced to endure a grueling rehab process and several humbling fights as he looked to regain his place atop the heavyweight mountain, Mir finally regained his title when he defeated Minotauro Nogueira at UFC 92 in December of 2008. It was the culmination of a remarkable comeback, but when asked about his perseverance, he likes to refer to his rematch with the Brazilian MMA icon three years later, when he was nearly stopped by Nogueira before roaring back to win. “It’s one of the things I’m proudest of,” Mir said. “When people want an analogy to explain how I think about things, I use the second Nogueira fight as an explanation. The reason why I’m so proud of that fight is because I think it sums up who I am as a person. There was a point, especially early on in the fight, that I wasn’t looking like I was gonna pull it off. It was bad, the fat lady was getting ready to belt one out, and I was able to come back and put it away in spectacular fashion. Since that bout, Mir has continued to hold his own with the best big men in the sport, most recently going 2-1 in three 2015 bouts, defeating Antonio Silva and Todd Duffee by knockout. Yet while he is currently preparing for a March meeting with Mark Hunt in Brisbane, Australia, Mir has still found time to take a brief moment to let his Hall of Fame induction sink in. Having it come from the Southern Nevada Sports Hall of Fame makes it even better. But for now, it’s back to work for a fighter who still has some mountains to climb.